Lara-Su Debut: This is a scan from StH #106 & is Lara-Su's first official appearance. 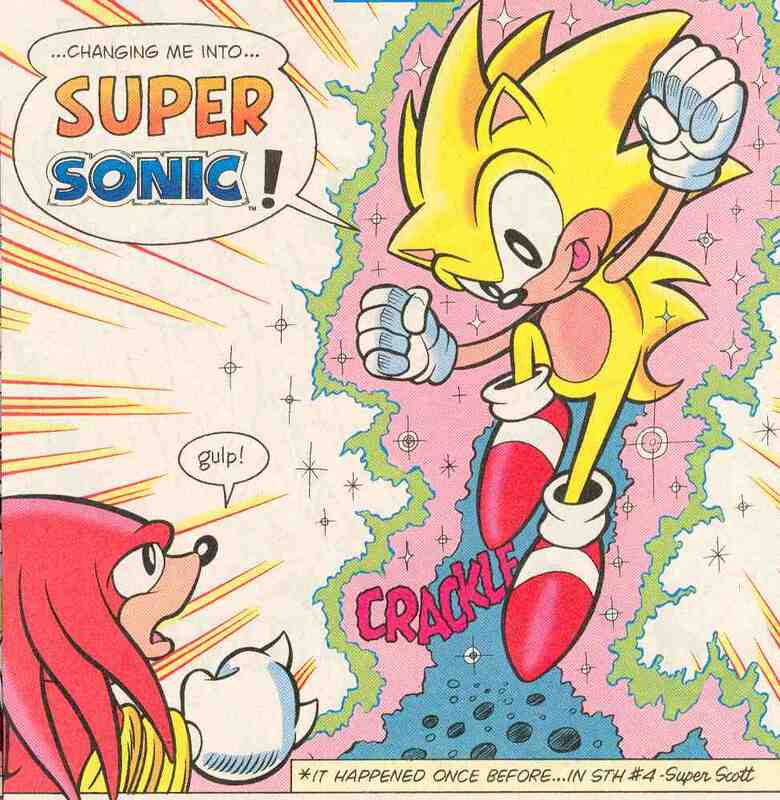 Super Sonic: Sonic becomes Super Sonic in the "Super Sonic Vs. Hyper Kncukles" special. 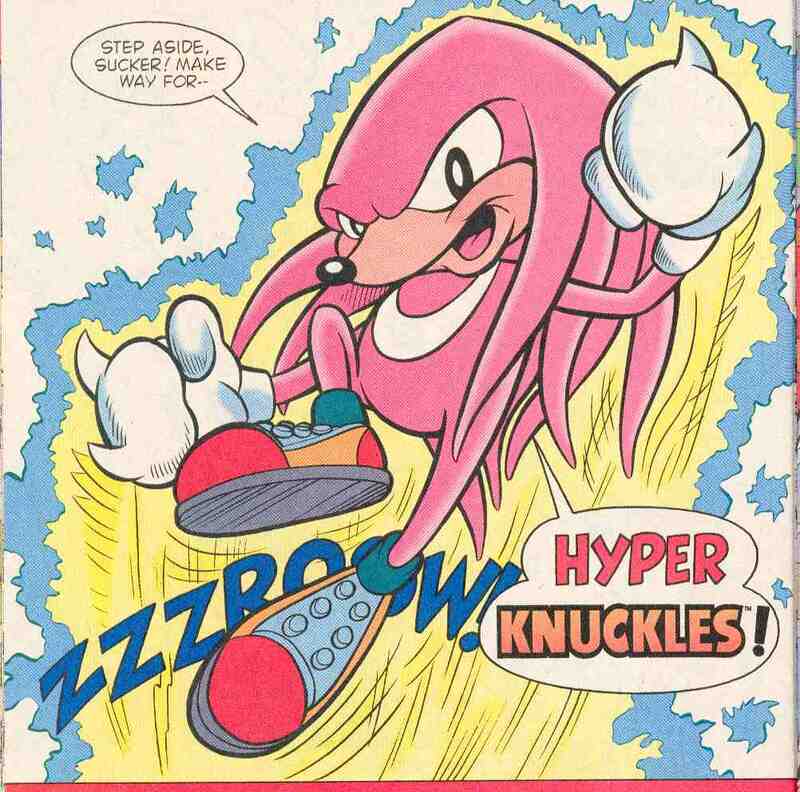 Hyper Knuckles:Knuckles goes Hyper in the same 48-page special. Lunar Sally: The "pin-up" from SSS#11. 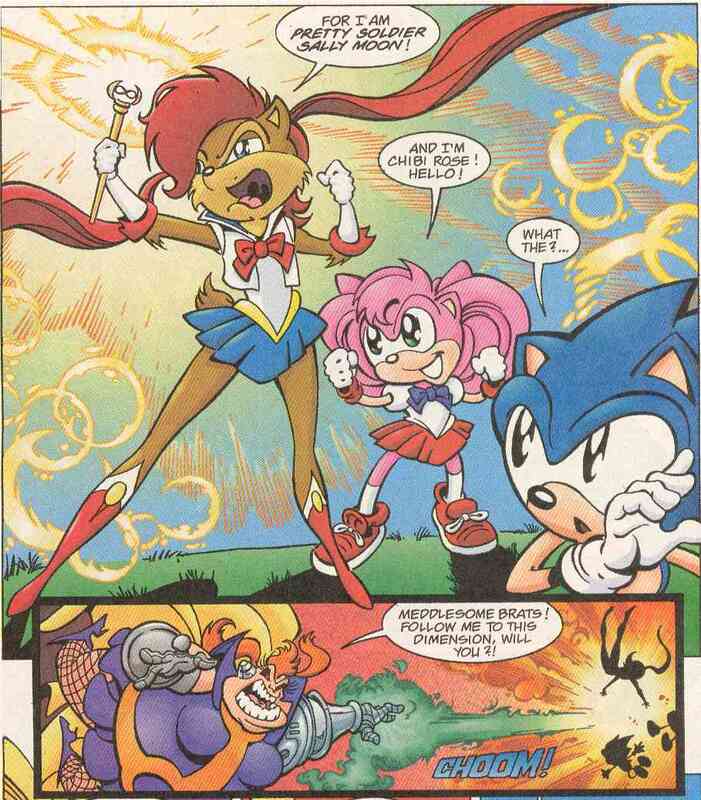 "Ascension": The Princess Sally solo from Sonic Super Special #11. "Upgrade": The Bunnie Rabbot story from SSS#11. 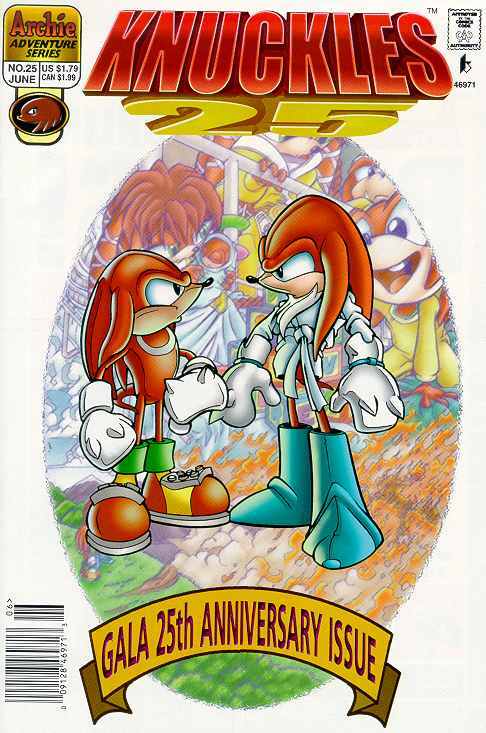 Comic Shop News--(Sonic & Knuckles cover). In case you're wondering why Ken's signature is on it--I ordered the CSN issues from him. 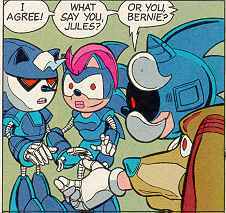 "The Ultimatum": Back-up story from Sonic #60, which was referenced in my "Regarding Sally" rant. 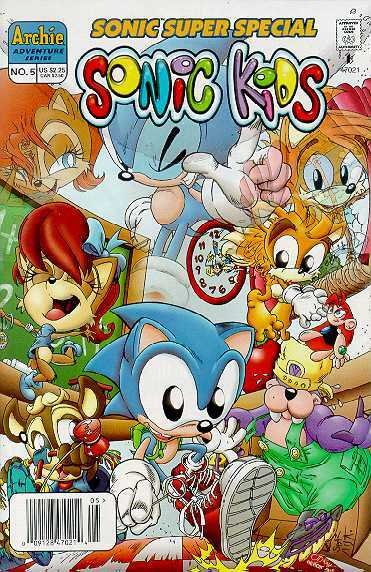 Sonic Kids--Cover: A scan of the cover of the Sonic Kids super special (SSS #9). Sailor Sally ?!? : From SSS #8. 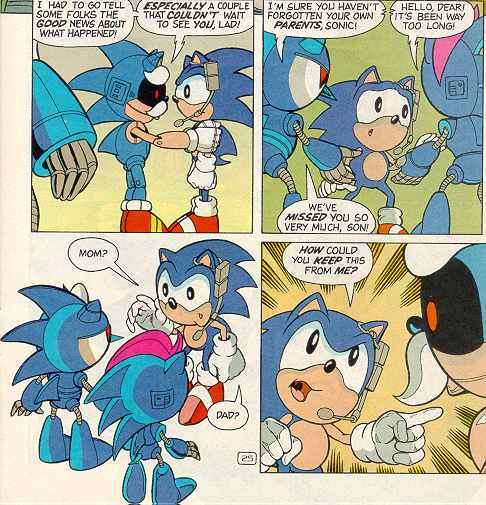 Sonic's Folks: The first appearance of Sonic's (roboticized) parents, from SSS#2: Brave New World. 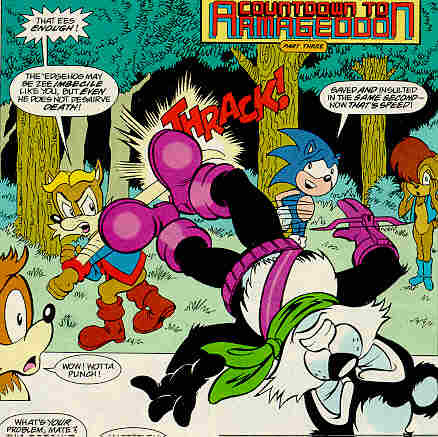 Antoine Vs. Geoffrey: Another scan from issue #46. Ant does what I'd LOVE to do--namely nail Geoffrey on the chin! 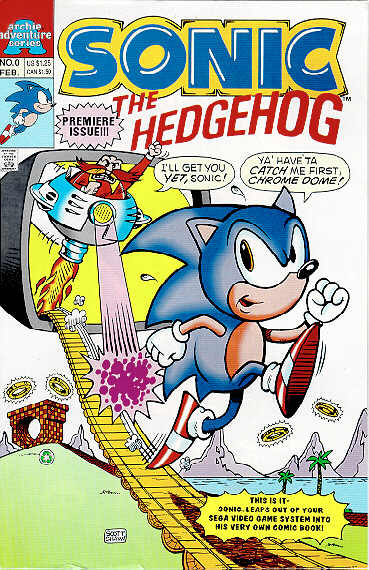 Sonic #39--cover: The cover from the issue in which the "Mecha Madness" story arc began. Mecha Sonic-- shot 1, shot 2, shot 3, shot 4: Various images of Mecha Sonic from StH #39. Bring it on! 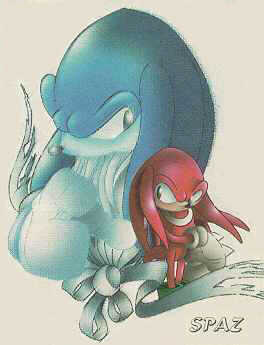 : Knuckles joins the fight. That's gotta hurt...: The fight continues, but Mecha Sonic seems to be winning! 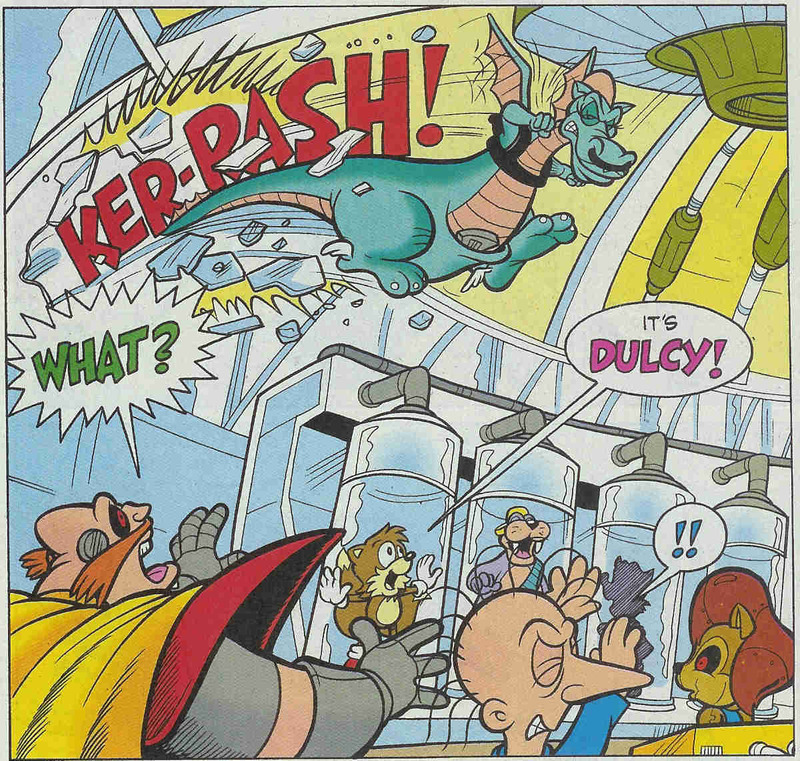 Impersonating a gargoyle: That's what Dulcy was doing while she was spying on Robotnik in issue #34. 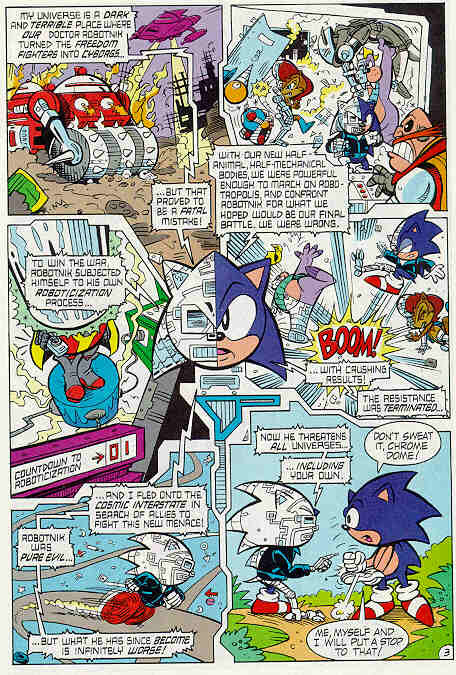 Cyborg Sonic: From StH#19. 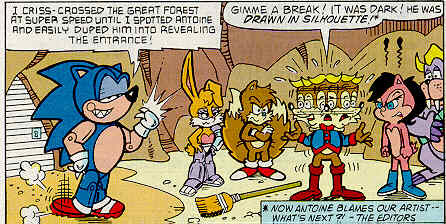 Cyborg Sonic appears in the "Archie" universe. 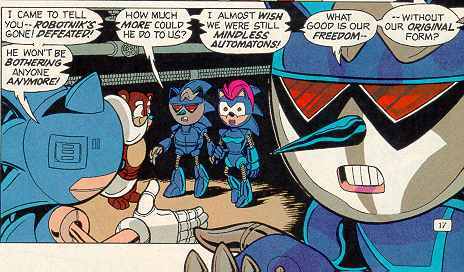 Cyborg Sonic Explains: Cyborg Sonic explains his predicament. Sonic ConventionVarious Sonics from different dimensions. From StH#19. 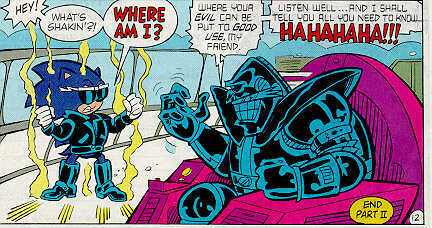 Something Wicked...Evil Sonic and Robo-Robotnik, from issue #19. 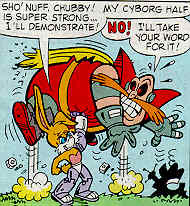 Giant BorgRobo-Robotnik uses the Giant Borg to attack Sonic and his other selves. From StH#19. 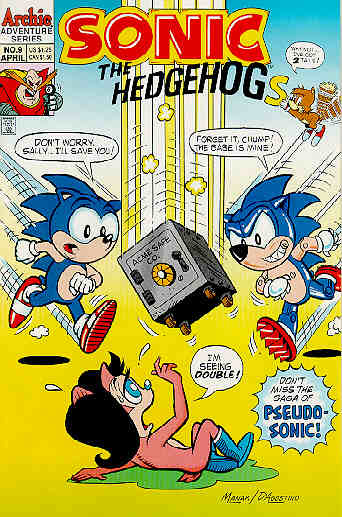 Double Trouble: The cover from StH#9. 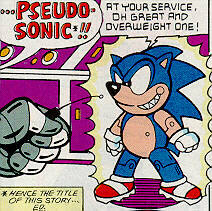 Pseudo-Sonic: The 1st appearance of Robotnik's Sonic-like robot (NOT Mecha Sonic!! 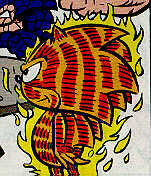 ), from StH#9. 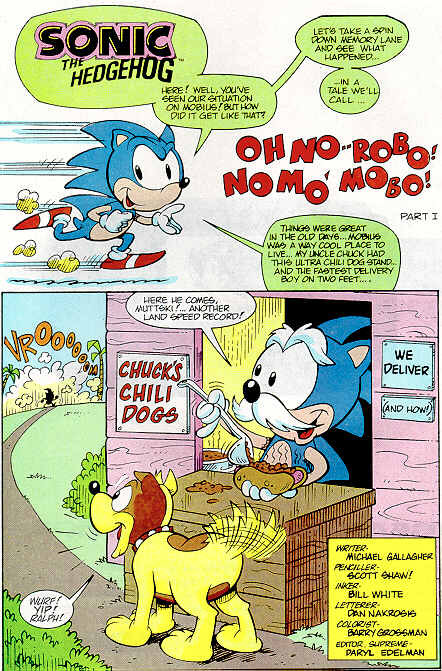 Tails Takes out Pseudo-Sonic: Self-explanitory. 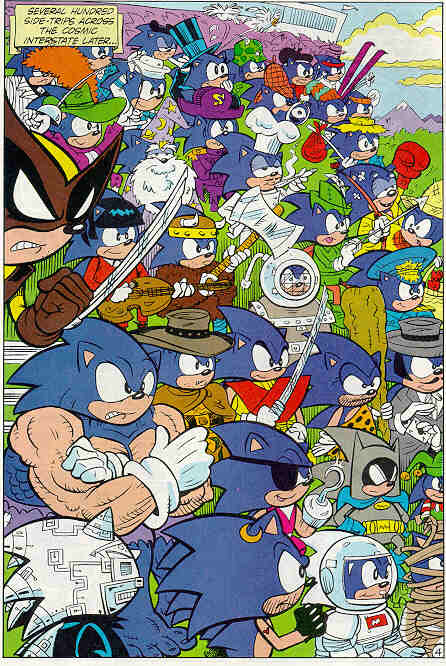 StH #3 Cover: The cover of Sonic the Hedgehog #3 (regular series). 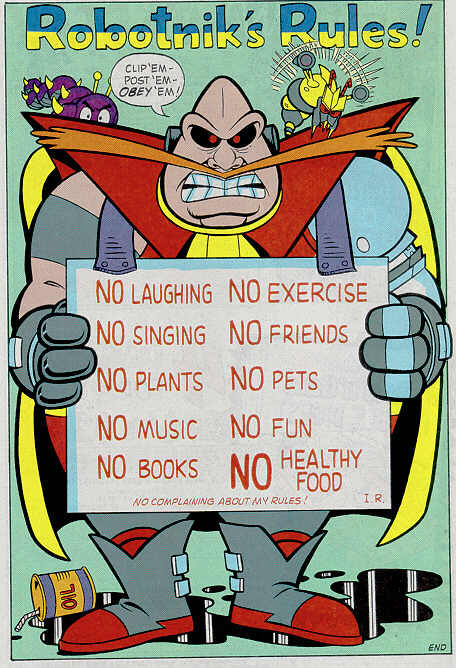 Robotnik's Rules: Pin-up page from StH #3 (regular series). 2-page 'preview' pin-up: From StH#2 (limited series). Beta Version?? : A closer look at the odd-looking incarnation of Bunnie from that pin-up. Who's Who? 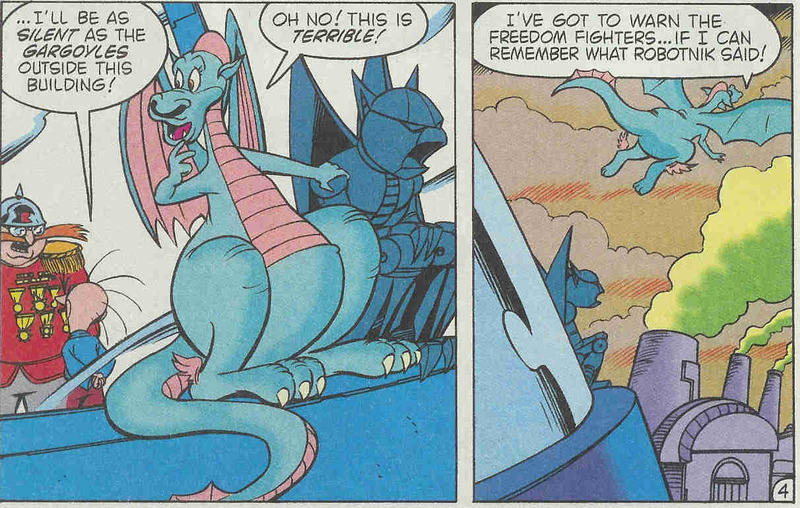 : The Rotor/Robotnik duel of masks from "The Bomb Bugs Me". 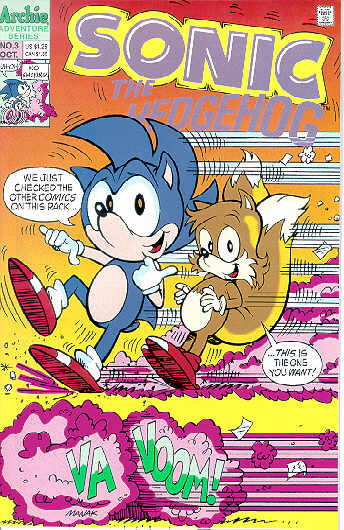 StH #0 Cover: The cover of Sonic the Hedgehog #0. 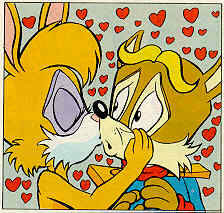 Chuck & Muttski: From StH #0. 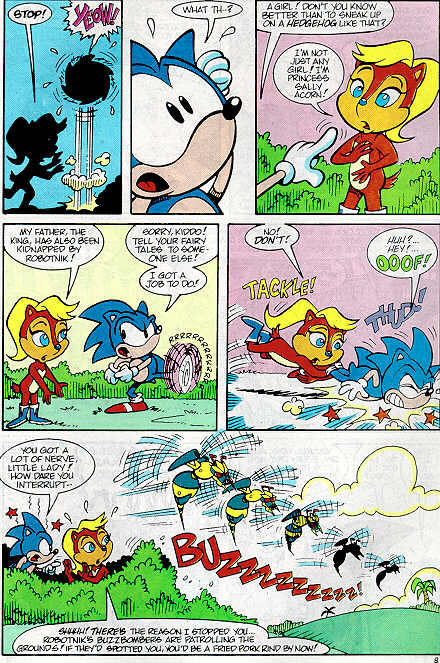 When Sonic Met Sally: From StH #0. 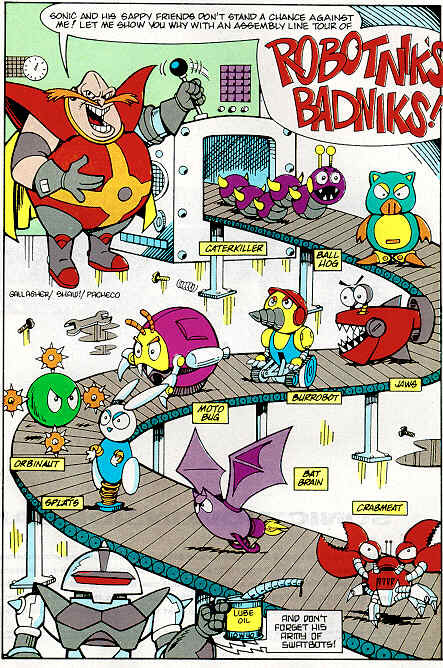 Badnik Rollcall:Uh, I don't recall which issue this badniks pin-up was in. 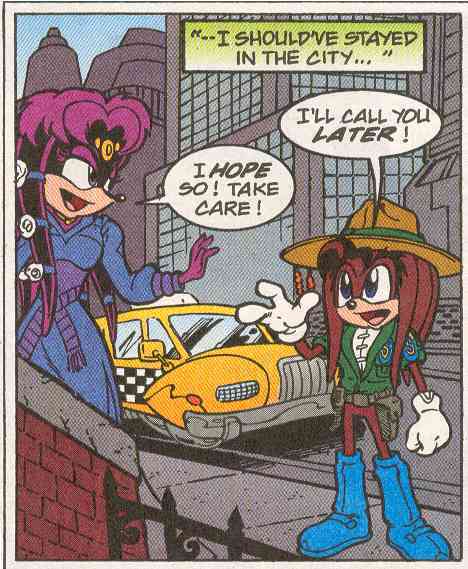 Fallout:The double-page spread of Constable Remington, escorting Knuckles and Julie-Su (from KtE#5). 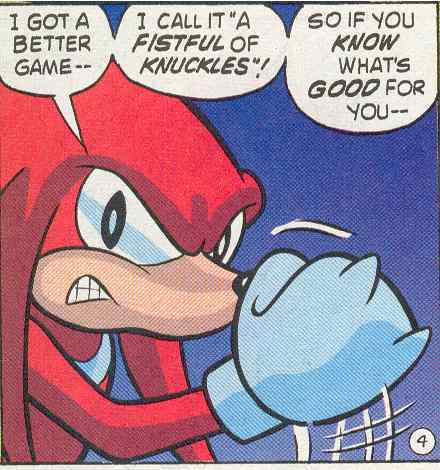 Knuckles meets Hawkings: Also from KtE#5. Prince Elias: Elias' first appearance (KtE#20). Julie-Su "Pro Art": A way past cool pin-up from KtE#22. 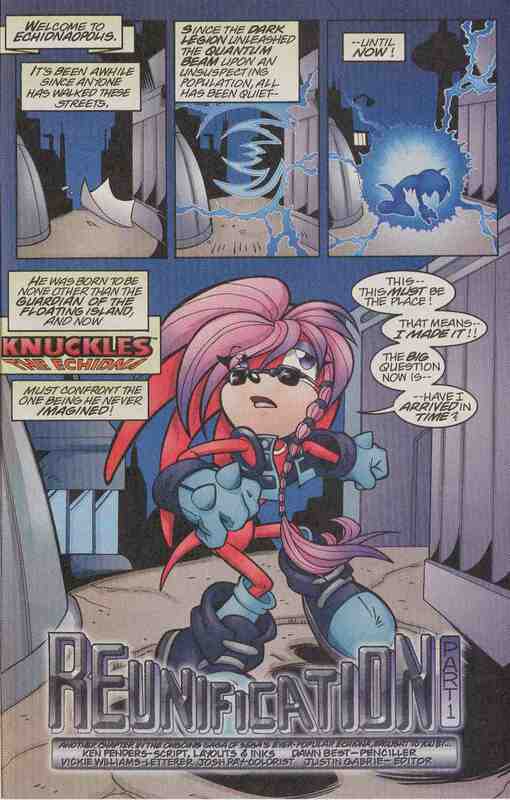 KtE#29--Chaotix "Pro Art": by Strom & Amash. Too Little, Too Late: Sally's "color changes" are explained in KtE #29 (on page 10). By now, does anybody even care? Sonic the Hedgehog, Dr. Robotnik, etc. 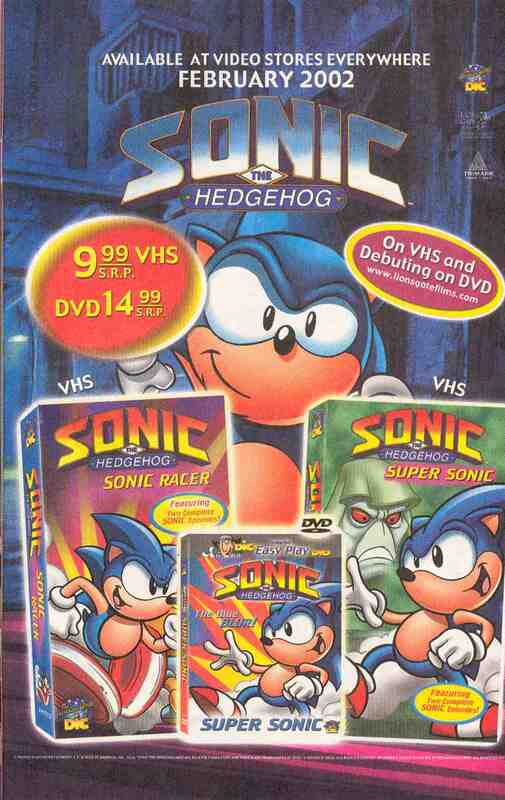 and all associated characters are the property of Sega and are used here without permission. 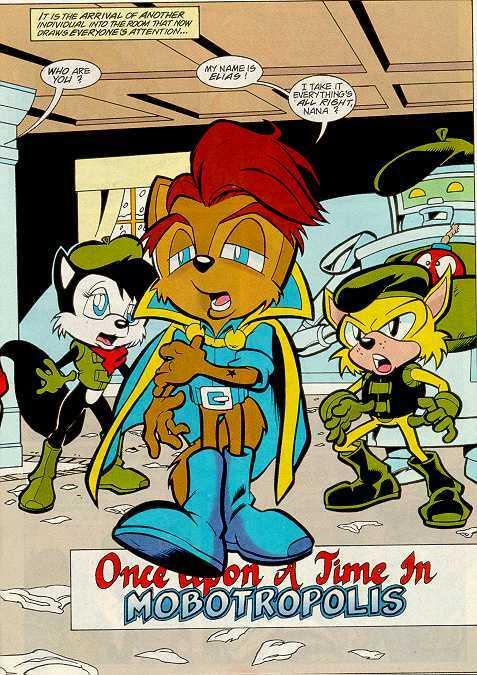 Julie-Su, Constable Remington, and Geoffrey St. John were created by some nuts at Archie Comics (but Sega owns them, too).. No infringement is intended and I am NOT making any money off of this usage. 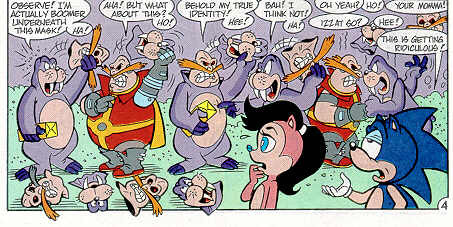 I'm doing this just for fun & for the amusement of other fans of Sonic and the Freedom Fighters. Please do not send lawyers and hoverunits after me! I'm not worth it !! REALLY!! !